*Complete one of my garments; post photo(s) of your creation on Ravelry and https://mycrochet.conceptcreative.store/ till June 2019. Free patterns, patterns that were completed by testers, included into CALs do not count in this give-away. The garment-pattern can be purchased in my shop anytime, but shared by you in 2019 for the first time. Please notify me once your photo is uploaded – I’ll send you this free pattern within 24 hours. Just posted your completed garment created by Conceptcreative.store on Ravelry and https://mycrochet.conceptcreative.store/ ? Contact me to receive this pattern for free. 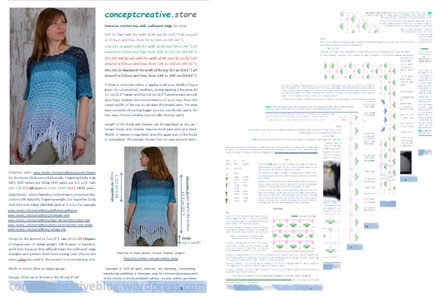 Previous Article ORIGAMI Crochet Sweater Spring – published! Such a wonderful article, thanks! Hi there! Such a nice site, thank you!